"You have a rendezvous with destiny!" – promised Major Gen William Lee to his men as the 101st Airborne Division was activated at Camp Claiborne, Louisiana, 15 August 1942. And the first place they kept that rendezvous was Normandy. 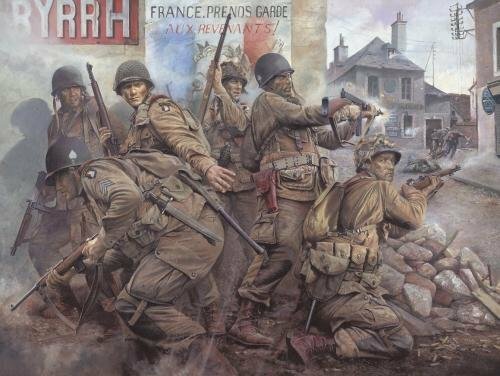 Specially commissioned by the Military Gallery, this dramatic new limited edition by Chris Collingwood, one of Britain’s foremost figure artists, portrays the men of Easy Company as they fight their way through the bullet-swept streets of Carentan. Facing the enemy in close combat house-to-house street fighting, the paratroopers relentlessly pounded the enemy until the last vestiges of German resistance were overwhelmed and the objective taken. But for the men of Easy Company and the 101st Airborne, this action is just the beginning of their distinguished but savage war. Others will follow: the liberation of the first Dutch city, Eindhoven; the siege of Bastogne during the Battle of the Bulge; and ultimately, the capture of Hitler’s ‘Eagles Nest’ at Berchtesgaden. Overall print size 30" X 25"